The Four I’s of the Credit Application Process - Credit Mediators Inc.
As we enter this New Year, I’d like to share some thoughts with you on the importance of improving and strengthening the credit application process. Information – In many companies, even prior to any sales proposals and contracts, the credit application is the first document that a creditor will ask their potential customer to fill out. As the initial source of credit, financial and other data, the amount of information being requested has to be commensurate with the amount of credit being requested. The link to the New Credit Application below is an example of a credit application that probably has way more information being requested than you’ll actually want your customer to fill out. But when you look at this sample application, are there any items which could be included and strengthen your own present application? For example, not too many applications ask if the organization owns or rents the premises where it is operating. For the most part, this may not yield much value to you if you’re only selling a small value product to your customer. However, if you were selling a product that would be installed and become a permanent fixture to the premises, then you would definitely need to know this information in the event that a lien needs to be filed to protect and perfect your interests. In addition, you will note on this sample application that there is a place for the owner to guarantee the debt on the last page. In most cases, especially with large corporations, the owner(s) or major stockholders would never sign this section. However, in other cases, especially when potential customers are closely held small and medium size businesses, a personal guarantor on the past due receivable could result in providing enormous leverage in whether you can ultimately collect or not. 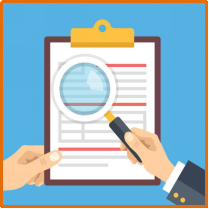 Investigation – Even with all the information nicely filled out, there needs to be a sufficient level of due diligence performed on the information received. Although the sales and profits are filled in, if the order is large enough, these numbers may need to be substantiated by the client’s financial statements. I realize that requesting financial statements from new customers to confirm credit information is not going to be easy, and often refused, but if you can get them, they will lend another level of comfort to confirming any other financial information on the credit application. This also holds true for understanding the corporate structure and the officers of the company. We have sometimes found in our own research that the president noted on the credit application was not actually the president recorded on the articles of incorporation or other official document. As you can imagine, finding these huge discrepancies for the first time during the collection or suit process is not encouraging. Interpretation – Try to read between the lines of what is written, and what is not. This is actually the most difficult part of every credit application evaluation process since many unwritten factors have to be balanced together in arriving at an approved credit number. For example, a website is often one of those indicators that could reflect a lot about a prospect. When you look at the site does it reflect a well-developed proactive entity or one that is terribly outdated, lackluster, and gives the impression that the company is not up to speed? Although this may not necessarily be a red flag, it also doesn’t contribute to the level of comfort in extending a significant amount of credit. Integration – Depending upon how often your customer is doing business with you, the information provided from the original credit application should be reviewed and updated as appropriate. If the data on the credit application resulted in a $100K credit limit being approved, but sales continue to creep up to level significantly over the established limit, integrating the additional information to support a new credit limit should be pursued. For most companies doing business on credit, especially where relatively large orders are submitted, a well developed credit application process in which the information is sufficiently obtained, confirmed, and evaluated will continue to strengthen your credit risk management system. This article has been edited by Steven Gan.